Google Analytics chart shows the May demographic profile for Times of San Diego. Times of San Diego was read by 226,551 people in May, a 38 percent increase compared to the independent website’s readership in the same month last year. Readership was driven by coverage of the mass shooting at a University City apartment at the beginning of the month, a 12-year-old dance prodigy‘s success, a big marijuana bust in Spring Valley and a series of articles about Navy ships deployed from San Diego. 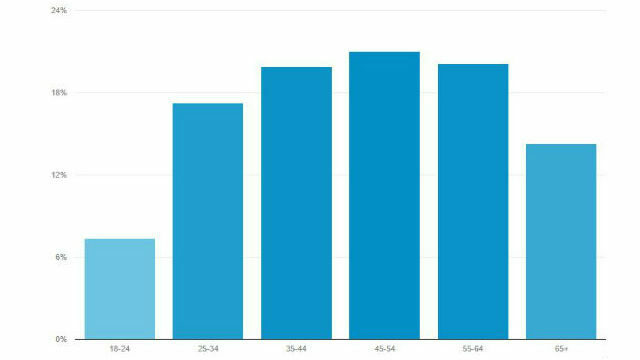 The website’s readers in May were mostly young and mobile. Some 66 percent were 54 or younger, and 63 percent of reading sessions were on smartphones or tablets. Over 30 percent of readers were in the city of San Diego, with another 22 percent elsewhere in Southern California. Many readers came from other parts of the United States, especially in the case of articles about the Navy and Marine Corps. Times of San Diego’s staff of seven contributing editors and photographers publish more than 20 articles daily about the major news developments throughout San Diego County. The site does not require a subscription, and a free newsletter with the top stories is sent at 8 a.m. daily. The publication is supported by national and local advertising and contributions from readers.